The Ebac DD200 is a heavy duty dehumidifier designed for industrial and commercial applications where effective low temperature operation is a high priority. 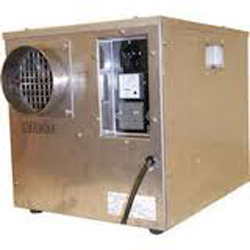 This unit is a desiccant dehumidifier which operates using a different process from the more common refrigerative type. This is the smallest unit in Ebac's range of desiccant dehumidifiers and is suitable for use in smaller areas. The Ebac DD200 dehumidifier uses a process different from that of a refrigerative dehumidifier to remove moisture from the air. The refrigerative dehumidifier condenses water vapour on to cold coils and the water is collected in a bucket or drained continuously. The DD200 is a desiccant dehumidifier. Moist air is drawn into the unit and passed over a slowly turning silica gel rotor and water from the air is absorbed by the rotor. Silica gel is a hygroscopic material, or desiccant, that absorbs moisture from the air. It is often used in a small packs and enclosed with moisture sensitive products, such as a camera, to absorb small amounts of water vapour and keep the product dry. Eventually silica gel becomes saturated so a desiccant dehumidifier has to remove the water continually from the rotor to allow it to absorb more from the air. During the slow turn of the rotor part of it is exposed to a flow of warm air from a heater within the unit to dry the silica gel. Having been dried the rotor now re-enters the stream of moist air and absorbs more water from it. The warm air that has dried the rotor now contains the moisture that was removed from the room. This warm, moist air has to be vented outside the building. The advantages of this method are that it does not require a bucket or a drain as there is no condensate. The process is also not affected by ice formation as refrigeration is not used. This allows the dehumidifier to work in lower temperatures than the refrigerative type and this unit can operate at temperatures as low as -4°F, that is to say 36°F below the freezing point of water at normal atmospheric pressure. This type of dehumidifier can also reduce humidity to a lower level than the refrigerative type and tends to be more reliable. The disadvantages are that this method uses more energy than a refrigerative dehumidifier, the units tend to be more expensive in relation to their water removing capacity and that ducting to the exterior of the building is always required. This type of dehumidifier will be most attractive to operators whose special requirements, and the value of the items being protected, justify the extra cost. Water extraction rates are affected by temperature and relative humidity as are those of refrigerative dehumidifiers. At 80°F and 60% relative humidity the Ebac DD200 will extract 40 pints per day but this rate declines with lower temperature and/or relative humidity. The Ebac DD200 is a durable unit ruggedly constructed from stainless steel for service in demanding environments. It is also compact. The dimensions of the Ebac DD200 are only 13 x 15 x 13.3 inches making it easy to install in areas where space is limited. The Ebac DD200 is portable weighing only 37.5 pounds and can be easily carried by one person. Its short-term use in each of a series of locations will make it necessary to connect it to existing ducting or to install temporary ducting to expel the moist air to the exterior of the building. A permanent installation of the DD200 is likely to be preferred in most cases. The DD200 incorporates a PTC Heater ensuring that its maximum drying capacity is reached immediately, and constantly maintained while the unit is running, to improve energy efficiency. The DD200 has a high efficiency patented PPS rotor incorporating 82% active silica gel for optimum performance. The rotor is washable and designed for high performance and long life. The DD200 also includes an ammeter to monitor the units drying effectiveness and a remote humidity sensor facility.